Well the results are coming in fast and fresh, while Barack Obama has been named to a second term as President of the United State, who would prevail if we left the election up to the residents of our favorite U.S. geo-oddities? 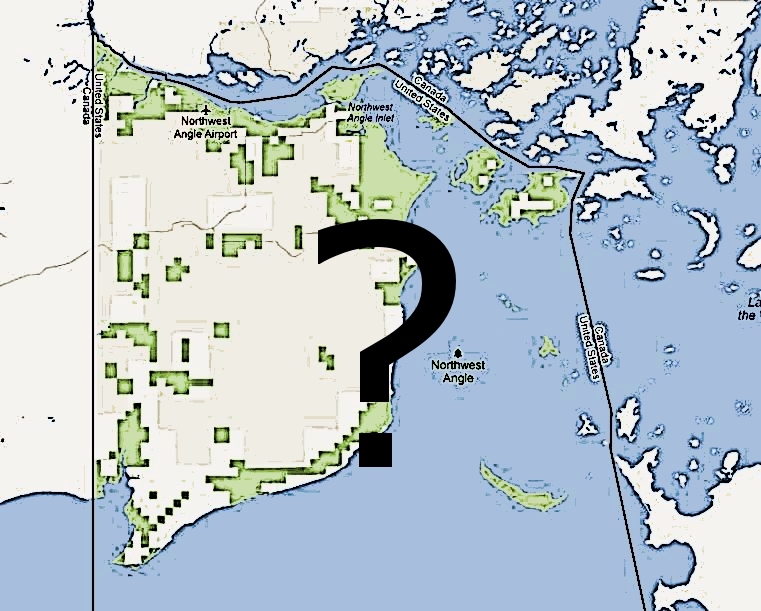 By no scientific means, I’ve automatically qualified the Kentucky Bend, the Northwest Angle (MN), Point Roberts (WA), Knotts Island (NC), the “lost peninsula” (MI) and the least populated county, Loving County in Texas. By all means, feel free to add to this count with your own suggestions. Read on for the results! First we turn to Minnesota, painted blue for the nationwide vote, but very much in Romney’s favor if we restrict it to the Northwest Angle, the nub jutting off of Canada and right into and over the 49th parallel. The Angle (Lake of the Woods Precinct 5C) netted Romney 68 votes to Obama’s 25. Early returns favor Romney! What happened to voters in the Kentucky Bend? On to the Bend, or Bubbleland so to speak, lost to mainland Kentucky due to the meandering of the Mississippi. All is quiet in Bubbleland, as it appears Fulton County’s western precincts didn’t even participate in the vote (see above image from Kentucky’s Secretary of State website). I assumed that the Bend – part of Fulton County D106 precinct – voted with D104 (the closest participating precinct). I’ll also assume Romney carried the Bend, as D104 picked Mitt 90-37 over Obama. However, out of the 17 people last reported to be living in the Bend, I have no idea how many are registered or even able to vote. For the purposes of this, I’m going to go ahead and give Mitt a 9-3 Bubbleland takeover. Let’s head over to Point Roberts, Washington, which, while only reachable by auto through Canada, is part of Whatcom County and votes in county precinct 101. Point Roberts was overwhelmingly Obama, throwing 345 votes his way to Romney’s 131. Libertarian Gary Johnson trailed far behind with 6. In Knotts Island, North Carolina – which is reachable through Virginia only (unless you take a car ferry) – It’s assumed Romney won. We are still waiting on the official count from Currituck County, but the county does list 409 registered Republicans to 285 Democrats (among 438 who are unaffiliated). I’ll keep an eye out on this one, as this could be the win Romney needs to swing the Geo-Oddity map in his favor after Obama’s big night in Point Roberts. Obama and Romney appear neck and neck when it comes to Michigan’s lost peninsula, which juts just north of Toledo, Ohio and is only accessible through the state of Ohio. I’m unsure of the population of the peninsula and I know for sure the peninsula doesn’t have it’s own precinct. My best guess is it votes with Erie Township precinct 1, which voted 439 for Obama and 409 for Romney. If about 100 people live in the lost peninsula, that would work out to about a 52-48 win for the President – fairly negligible. Lastly, tiny Loving County (in Texas), the least populated county in the U.S. The proud residents of Mentone and other rural parts of Loving gave Romney an overwhelming victory with a 54-9 vote (throwing one vote Gary Johnson’s way). At this point it’s to early to give a final count. Stay tuned to this post over the next couple days (and feel free to suggest more places to add) as we decide the new President of the United Geo-Oddities of America! Very good breakdown of the geo oddities. I have a couple other interesting ones. How did the four corners vote? Also what about the Aleutian Islands? How about Montana’s nose? The thumb of Michigan? And of course the chimney of Idaho?